Sleep after having a baby is something that people always say we as moms just have to get used to not having for the next . . . let’s say . . . 18 years. But I refuse to believe that has to be the case and I love getting to share tips and tricks with new moms who are sort of at a loss when it comes to their infants sleep habits. We have a lot of control over our babies sleep patterns and we may be unknowingly preventing our babies from sleeping through the night! Getting your newborn on a day and night cycle is imperative to the success of getting them to sleep through the night. The first weeks of their life the baby sleeps so much it’s hard to get the routine started, but we can try our hardest to make them aware. Keeping the house dim and quiet all day and all night confuses the baby. From the first day home I always made sure that when it is morning and day time the blinds are open, I am not careful about making noise (if you have other children this will be easy! ), and I interact lots with them, especially in the few precious moments their eyes actually open. When it starts to become bedtime that is when we wind down, I dim the lights, I make sure the house gets quieter with no extra stimulation. Then when it is bedtime I lay them down in their crib with the same routine every night. If they are still in the phase of NEEDING to eat in the night I wake up, feed them in the dark, no talking, no eye contact, and lay them directly back down. Getting them aroused with lights, TV noise, and talking they think it is time to be awake. I know it is hard! You may be a night owl and want to hold and rock them all night, but there will be plenty of time for that the next day and both you and baby need rest! Having a consistent bedtime is the first priority, then consistent nap times. My bedtime with my first was a lot more liberal than my bedtime with my second because with my first we were a lot more social and out and about. With two little ones we tended to be home bodies a little more trying to juggle the two under two thing, we were ready for bedtime when it rolled around! Look at your schedule of your normal week and decide when the baby has to be up in the morning, for daycare, or the nanny or maybe you stay home, and pick a “wake up time.” Then go 12 hours prior and make that the bedtime. Twelve hours sleeping through the night was my ultimate goal and babies can more than accomplish this so I always did 8pm-8am as sleeping through the night. It didn’t take my boys long to get there. Have hope mama! Naptimes need to be somewhat consistent as well. Click here for a more in-depth “how to” sleep schedule routine. Babies only NEED to eat every few hours over 24-hours for just a short time (until they’ve reached and surpassed their birth weight and are at least 11 lbs), after that phase has passed and they are still waking up it could be because they have fallen into a habit of feeling like they are “supposed” to wake up and eat in the night. To prevent this, make sure that every milestone they hit you are keeping up with their dietary needs throughout the day. I found once we started cereal in the evening I knew they could go longer at night and I didn’t jump up to feed them right away. I would try their pacifier or letting them self soothe for a few moments before beginning a nighttime feeding. For some reason between our parents’ generation and our generation allowing our babies to “self soothe” has become a swear word. But jumping up to every whimper will create bad habits and then we will be slaves to their cries for a lot longer than necessary. It is okay to let your baby cry for a few moments while waiting to see if they will settle on their own. Baby’s will often cry in their sleep and when we go in to feed them or change their diaper assuming what they need we wake them up when they didn’t even need to be. A great way to get your feet wet with this idea is to have them self soothe at nap time, then you are fully awake and able to really concentrate on how long you are letting them cry. I always set my microwave timer for 10 minutes at a time and oh my word, 2 minutes feels like an eternity when they are crying but they almost always settled themselves by minute 10 and eventually they didn’t cry at all when I laid them down. This goes back to keeping bedtimes somewhat consistent but also the environment baby sleeps in. Just like I don’t sleep very well away from my own bed and the comfort of my own home, I found my babies always slept better when they were in their own comfortable space at bedtime. Co-sleeping or independent sleeping, keeping things somewhat similar every bedtime will help baby recognize it is time to go to sleep. Babies and sleep seem like an oxymoron for a lot of people and more often than not parents have to put the work in to get them to have healthy sleep habits. It is possible and the more work you put in earlier the better success you will have later on. Stay consistent and watch what happens! As always, these tips only will work if you have already sought professional advice assurance that your baby isn’t struggling from a more serious medical condition. What is Eat, Play, Sleep? 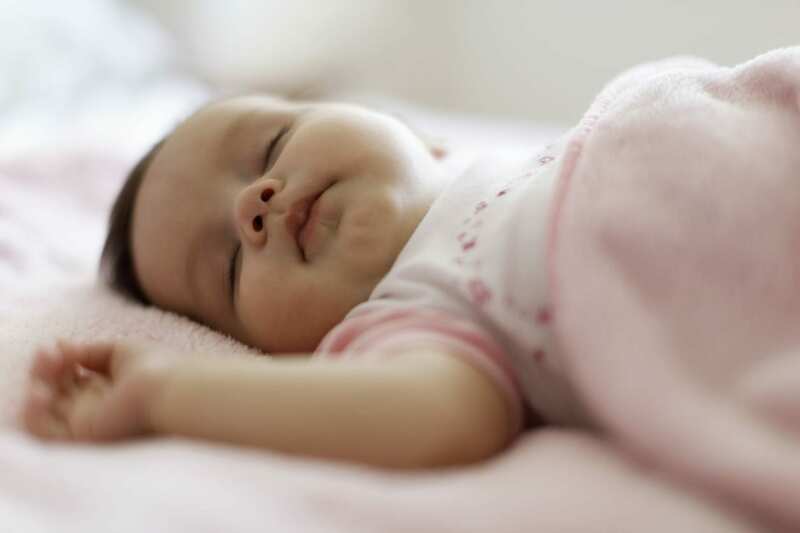 How Many Hours of Sleep Does Your Baby Need? Safe Sleep: When Can Baby Sleep on his Tummy? Hannah Southerland is a stay-at-home mom and wife of two little boys. She blinked and now they are 3 and 4 and taking over her world with karate moves and an endless need for snacks. Over the past 4 years, she’s been researching topics on sleep, baby care, and motherhood, trying to parent the best way she knows how!